Don’t use –best with vp9, use –good instead. –best is _extremely_ slow and not recommended because it won’t help very much. Thanks, still can’t get it to work, My guess is the versions of libavcodec, libavutil etc. that come with Ubuntu 13.10 are old and can’t handle hevc and vp9 files. You need ffmpeg 2.2 or higher. I have a recent development versiion of ffmpeg which I had to build on Ubuntu. I’ve tried manually editing qpsnr’s makefile to use FFMPEG’s libraries instead but i get strange errors about linking that I dont understand as my knowlegde of C and C++ is limited at best. Please can you tell me what Linux distro and version you use. Thanks, finally got it to work. I kept getting linker errors so I had to rebuild ffmpeg with -enable-shared and –enable-static configure flags. Then I put an -L/path/to/ffmpeg/libs in the Makefile for QPSNR and that got it to work. Encode time was about 20 hours on my cpu using vpxenc 1.3.0 and ffmpeg 2.2.2. I should mention that I have had success encoding full length movies with vp9 using somewhat lower settings while still maintaining pretty nice quality in a pretty reasonable amount of time. If you would like an example you can just email me at kitcat490@gmail.com (don’t want to post publically for obvious reasons). 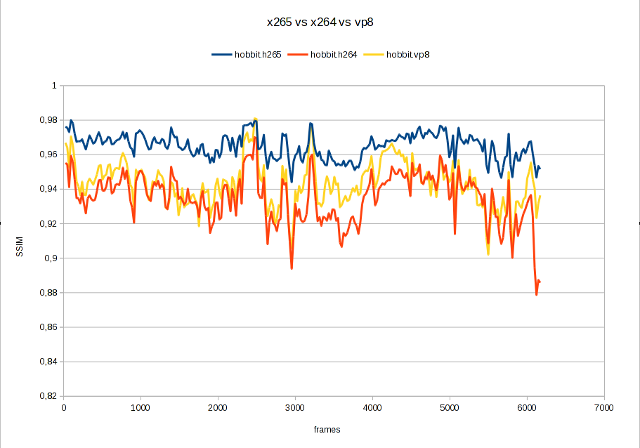 This updated comparison is still very inaccurate for both x265 and vp9, you are still comparing different rate factor methods instead of creating an encoding with each encoder at the same bitrate. This is where you will actually notice a difference with x265 or vp9. Using crf is quick and dirty, it will give you a video of the quality you selected but the file size and bitrate aren’t predictable. For example you should use something like the following for x265 and similar settings for x264 and vp9 as well. and you can add more fine tuning from there. Also if you use crf, a crf of 20 will give you similar subjective quality to the source, although not perfect, so at 28 you lose a lot of quality. x265 didn’t support bitrate as target when I did the comparison, I’m pretty sure I wrote it somewhere. 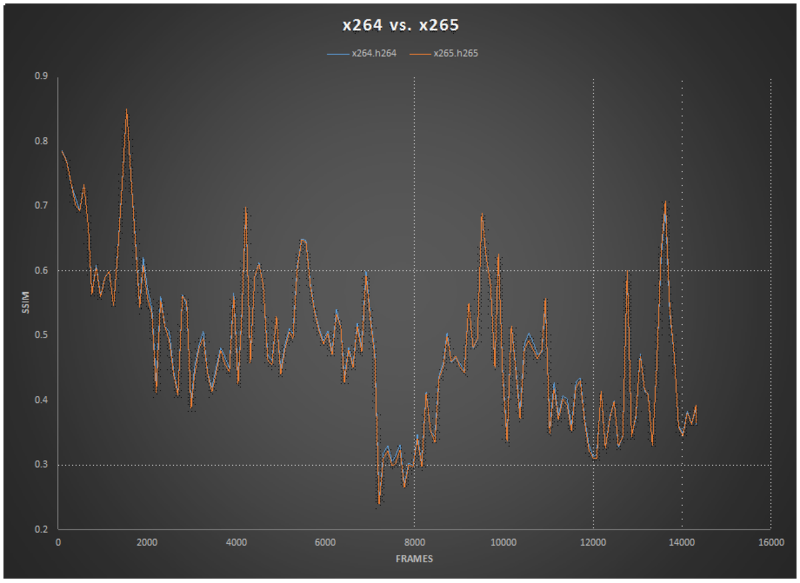 x265 has for a very long time (pre 0.6 at least), if not always has supported single pass abr with variable bitrate options. Although currently support for 2 pass abr has not been implemented. If you read the documentation it is all there, and I wouldn’t trust the credibility of half the people that frequent that irc channel despite some of them being developers, or at least claim to be. When I initially started these encodings I didn’t realize I hadn’t reset the bitrate on my encoding cluster to a higher value, but this also makes for a good example of x265’s ability to produce watchable video at low bitrates. From this comparison you can see that encoding with identical bitrates in both x264 and x265 yields similar file sizes (not enough deviation to matter). However it becomes apparent at such a low bitrate that x265 is able to maintain perceived quality, whereas the x264 encoding suffers from blocking artifacts to the point it isn’t even watchable at times. I was planning to include a vp9 encoding, but it will not be complete for about a week at the settings I am using. Yes, I meant 2 pass abr because single pass didn’t give me close enough file sizes. That statement is incorrect, single pass vs. two pass will not yield any difference in file size (with both you are still using a fixed bitrate), two pass merely allows for better optimizations for quality. Single pass x265 is already great, there obviously will be an improvement when two pass is complete though. Informasi yang disampaikan diuraikan dengan sesimpel mungkin namun mudah dipahami ….